Rutte calls Erdogan's branding of the Netherlands "fascist" as "crazy"
A major row has blown up between the Netherlands and Turkey after The Hague banned the Turkish foreign minister from visiting the country to drum up support for his president’s referendum back home. Ankara is conducting political campaigning throughout the Turkish dispora, and several EU countries have banned referendum meetings on public order grounds. The April vote is designed to give more powers to the presidency. The Netherlands is also in the middle of a bruising election campaign, with immigration the red-hot issue. “Crazy remarks of course. I understand the Turks are angry, but of course this is way out of line. 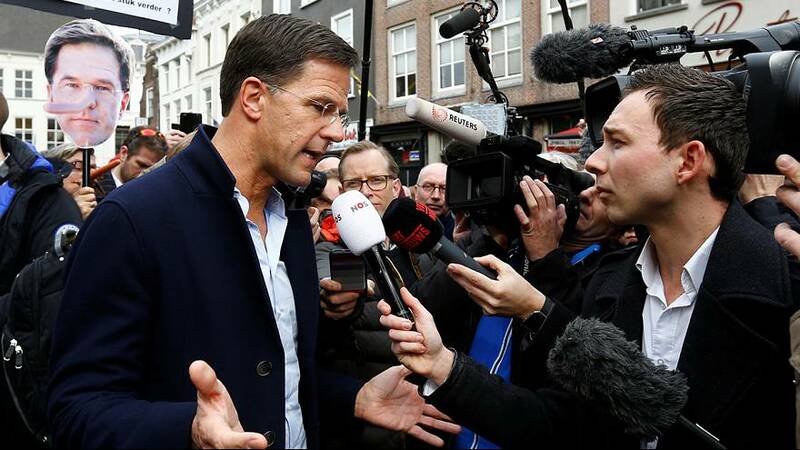 We will do everything to keep relations with Turkey as good as possible, as strong as possible, we have strong bonds over a couple of hundred years, and we want first to have official relations with Turkey, so I’m very much motivated, but of course today was not a good day for the Turkish-Dutch relations,” said Prime Minister Mark Rutte. The “crazy remarks” noted by Rutte came from Turkish President Recep Tayyip Erdogan, who threatened sanctions against the Netherlands for the flight ban, and promised retaliatory bans on Dutch politicians visiting. He then went further. “We will undoubtedly launch our sanctions against them after the 16th of April. They are so cowardly. They are Nazi remnants, they are fascists. That’s how it is,” thundered Erdogan at an AK party rally in Istanbul. Foreign Minister Mevlut Cavusoglu explained on TV that when he heard the referendum rally in the Netherlands had been banned he determined to go anyway, and that was when he was refused permission to land. Europe, he said, had to rid itself of its “boss-like attitude”. R E F E R E N D U M ?